As Russia celebrates International Women's Day on March 8, the Cosmonaut Training Center reveals what it is like to be a female cosmonaut in Russia. Ahead of Women’s Day, celebrated on Mar. 8 in Russia, the Cosmonaut Training Center has revealed some facts about women in space. Will Sarah Brightman go into space, when will female Russian cosmonauts fly into space again, and what’s the difference between Western and Russian approaches to women in near-Earth space? “The training program for space flights makes no distinction between men and women,” said Alexei Temerov, a spokesman for the Cosmonaut Training Center (CTC). Today the team of Russian cosmonauts includes two women. One of them, Yelena Serova, will be going into space in the second half of 2014 and is currently in training for the flight. Experts at the CTC emphasize that there is no difference between her training and the training given to men. 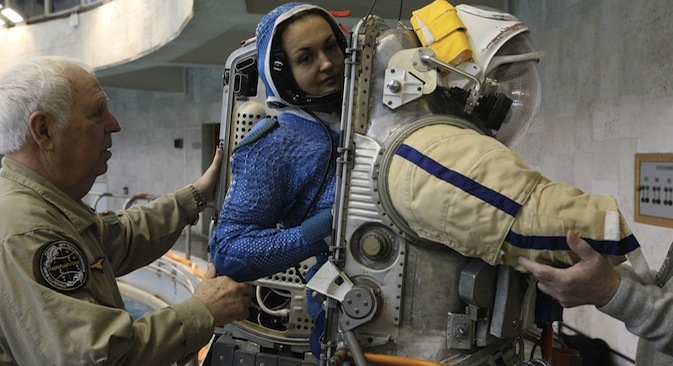 Anna Kikina, the second woman cosmonaut in the Russian space squad, is studying and training. On the subject of a space flight by Sarah Brightman, spokespersons for the CTC stated that she has passed the medical examination for space flight with excellent results and could start her pre-flight training at any moment. They refuted the rumours that have appeared in the media about Brightman possibly giving up on the idea of flying in space. Commenting on the plans of the world’s first space tourist, Dennis Tito, to send a married couple to Mars, Russian space experts have noted that it is premature to talk about such a flight — mainly because the problem of how to overcome cosmic radiation has not yet been solved. In addition, a trip to Mars would be a big test for the space travelers’ family ties. “Imagine that you see someone, even if it’s someone you love very much, for almost one and a half years in an enclosed space. Soon after the flight starts you’ll inevitably run out of topics for conversation, and then, psychologically, you’ll get more and more tired of this person," said psychologist Vadim Gushchin. Russian space experts also gave an assessment of the differences between Western and Russian approaches to space flights that involve women. According to them, the most important reason for the large number of American women who have been in space is the political setup in the West that supports feminism. According to experts, another reason for the big difference in the number of women cosmonauts between the United States and Europe, on the one hand, and Russia, on the other, is the difference in their space programs. The Shuttle was capable of taking six people into orbit, whereas the crew of a Russian spacecraft consists of a maximum of three. Hence the long list of cosmonauts waiting for a flight. Regarding the relationships between women and men as part of a space crew, the CTC psychologist cited the view of American female astronaut Shannon Lucid. According to her, it is important on a flight to pick the right key to each member of the crew. It is not about doing all the work exactly as a man would, but about creating a comfortable psychological climate in the spacecraft. To do this, a female astronaut may yield to their counterpart’s desire to be the knight and to do the more difficult tasks for her.